Colombia has been a dangerous country for women, where physical and sexual violence were used as weapons in war. Since 1985, the Colombian government’s Victim’s Unit has registered over 17,500 female victims of conflict-related sexual assault, reported Amnesty International. The National Network of Information, a Colombian government tool that enforces the “victims and reparations” law, has registered 2.5 million women victims. The conflict in Colombia rendered 6.3 million people internally displaced with the majority being women, according to The Internal Displacement Monitoring Centre, a nonprofit in Switzerland that tracks global internal displacement. This was evident in the role of women played during previous peace negotiations. During talks between former President Andrés Pastrana and the FARC, from 1999 to 2002, nearly 300 women’s organizations and over 700 women delegates organized for months and gathered at a Constitutional Assembly where they agreed on an agenda that informed the gender perspective for the most recent peace negotiations and laid the foundation for future women’s mobilization. At age fifty-four, Teresa Aristizabal—Director of the Antioquia region for Ruta Pacífica, or Peaceful Path, a women’s rights organization—has lived her entire life within the context of war. For the past twenty years, she has worked with Peaceful Path specializing in women’s reproductive rights and supporting victims of sexual violence. Aristizabal grew up in Medellín where she continues to work. She says the city has been altered by the violence. Aristizabal traveled to Havana four times to participate in the peace talks. Initially the Colombian government did not have women delegates at the Havana peace talks. But women peace advocates pushed back for the government to include women and for both the government and the FARC to allow women in the victim delegations. They felt that a peace agreement without their voices would only lead to more violence. Women advocates held a National Summit of Women and Peace which featured the participation of 450 organizations and demanded that UN Security Resolution 1325 be respected, requiring women’s participation in peace processes. Because of their persistence, President Santos appointed two women government delegates two weeks later. The FARC welcomed women’s participation in the peace building process. By the end of the peace talks, women comprised over 60 percent of the victim’s delegation in Havana, UN Women reported. The peace talks had sixteen women representatives making up a third of the delegates. Colombia was the first country to create a peace agreement that dedicated a chapter to gender. The joint agreement is seemingly supported by available evidence. When women are involved in the making of peace agreements, it is 35 percent more likely to last for fifteen years, according to the International Peace Institute. For Aristizabal the peace talks were a sign that the voices of victims, and specifically women victims, were finally being heard. She explained over Skype that it was women who were mostly the head of households caring for their families and maintaining communities for decades. The most recent cycle of peace negotiations was formally announced in 2012 and took place in Havana, Cuba. After four years of negotiations, in Aug. 2016 the Colombian government and the FARC announced the peace deal. The agreement was to be ratified by a democratic referendum where Colombians in Colombia and those who had registered with the Consulates abroad could all vote. In the beginning of Oct. 2016, Colombians held the plebiscite. Polls predicted that the “yes” vote in favor of the peace deal would win. However, a low voter turnout, rural and urban divides, political polarization, extreme weather and many who felt the peace deal gave impunity to the FARC led to an unexpected result for many. The “no” vote won with a slim margin of 54,000 votes at 50.21 percent. After the defeat, the Santos administration and the FARC returned to the negotiation table. Over the next month, they revised the peace deal and many compromises later, President Santos skipped the polls and brought the deal to Congress, in which his party was largely in support of the accord. Opponents in Congress, led by ex-President and current Senator Álvaro Uribe, boycotted resulting in a unanimous win favoring the modified peace agreement. Proponents of the deal worried that the changes cut out many human rights protections for the LGBTQ community and human rights defenders. In fact, advocates have already warned that anti-LGBTQ sentiments and violence against social leaders have increased. Whereas opponents felt the new peace deal was rushed through without public and democratic consensus. They criticized the new accord for not mandating prison sentences to ex-FARC who had committed crimes such as kidnappings or murders. Despite concerns, some pro-peace advocates viewed this as a new beginning to be celebrated. They also realized that the work ahead of building sustainable peace in a divided country would be just as grim. 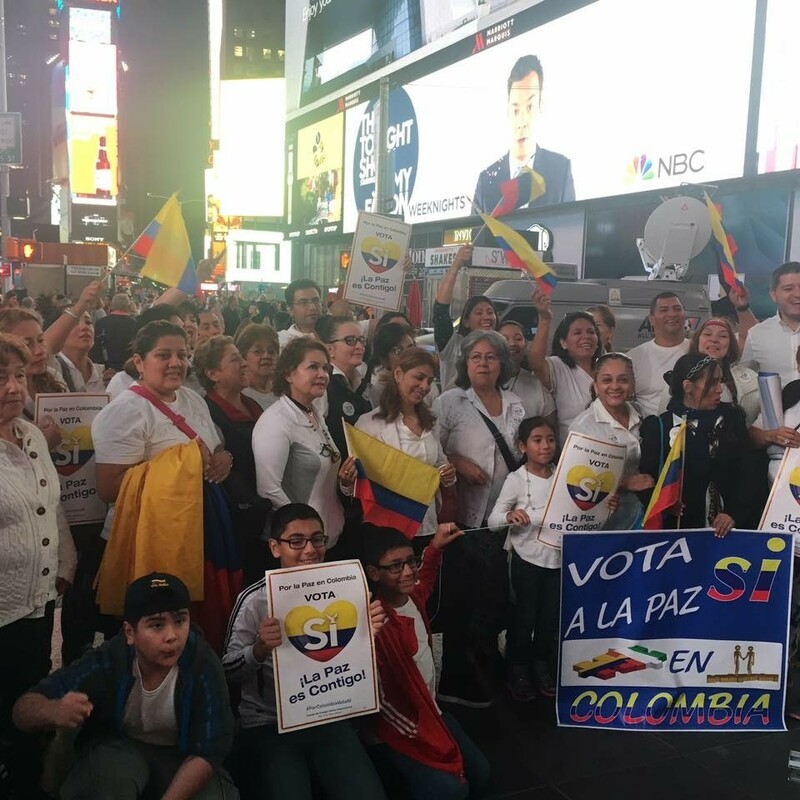 On the evening the peace deal was signed, Colombians in New York met in Times Square holding white balloons, wearing “Colombians for Peace” shirts and dancing in celebration of the historic moment. Among them was Milena Gutierrez, a social worker at an adoption agency in Manhattan who was a leader for the peace movement in New York. Gutierrez grew up in Medellín, Colombia but when violence spiked in the 1990s, her family started to think about leaving the country. In 2002, at age sixteen, Gutierrez moved to New York City to join her mother who had been granted amnesty. Gutierrez joined a global movement for the “Yes” campaign in favor of the peace accord between the Colombian government and the FARC. She helped organize conferences, host debates and campaign at community events. She even persuaded a father and son to vote “yes” at a summer street fair. Despite being heartbroken over the initial loss to the “No” vote, Gutierrez continued to agitate for peace. With other Colombians, she helped co-found “Red de Colombianos por la Paz,” or Network of Colombians for Peace. Gutierrez also joined a new global political movement for Colombia called Compromiso Ciudadano, or The Citizen’s Commitment, and she is helping lead their women’s chapter. With the peace deal signed, the FARC have begun to disarm. In February, government talks with a second guerilla group, the National Liberation Army (ELN), commenced in Quito, Ecuador. Colombia is on the brink of peace and many are hopeful, but also wary about a still divided, Colombia. 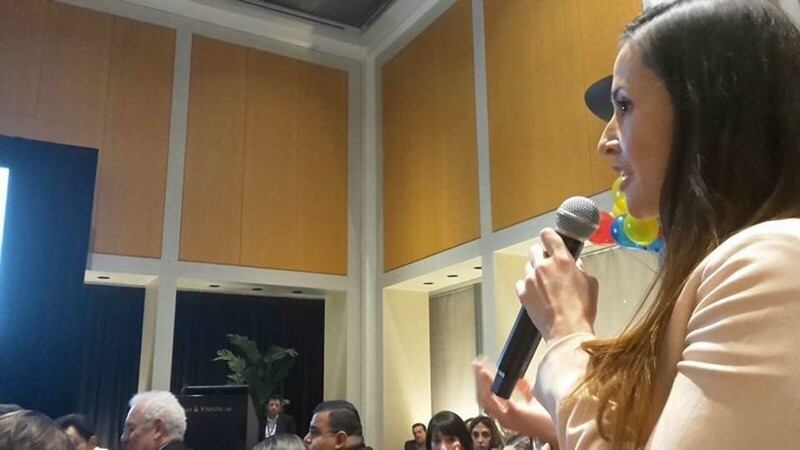 “We're very good at creating great documents, but what we're not as good at is creating funding and implementing those great documents,” Dr. Catalina Rojas, a Colombian conflict and gender researcher currently living in Washington D.C., said in a phone interview. The implementation of peace has already run into roadblocks with insufficient resources in disarmament zones for ex-FARC and the increase of threats against those who choose to speak out for social justice. With 60 activists assassinated in 2016, as reported by the United Nations in Mar. 2017, advocates says the greatest threat to a peaceful Colombia is the rise of attacks against the human rights defenders. One of these advocates is Colombian human rights attorney, Viviana Osorio. “A peace with no social and gender justice, won’t be ever be a sustainable and lasting peace,” Osorio said in New York City after presenting on union and women rights at the UN’s Commission on the Status of Women in March. Colombian women advocates remain committed to working towards this justice and being the backbone of peace in Colombia. Nicole Rothwell is a multimedia journalist reporting on global human rights. Follow her on Twitter at @NicoleARothwell.